TAISO YOSHITOSHI lived from 1839 until 1892 and is considered to be one of the greatest artists of the Meiji era. 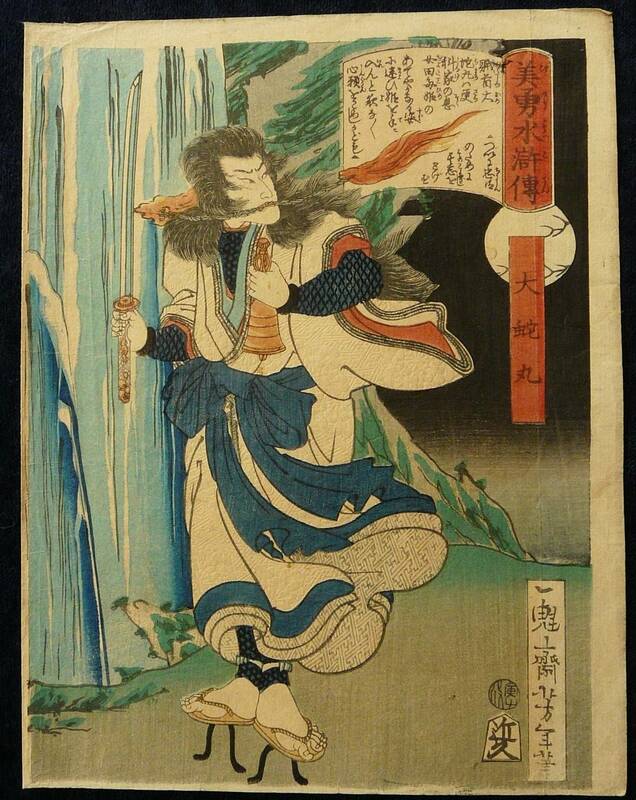 He was a student of Kuniyoshi along with Yoshiiku and, even though he was considered the greater talent, when Kuniyoshi died, he was named the heir apparent to the school. 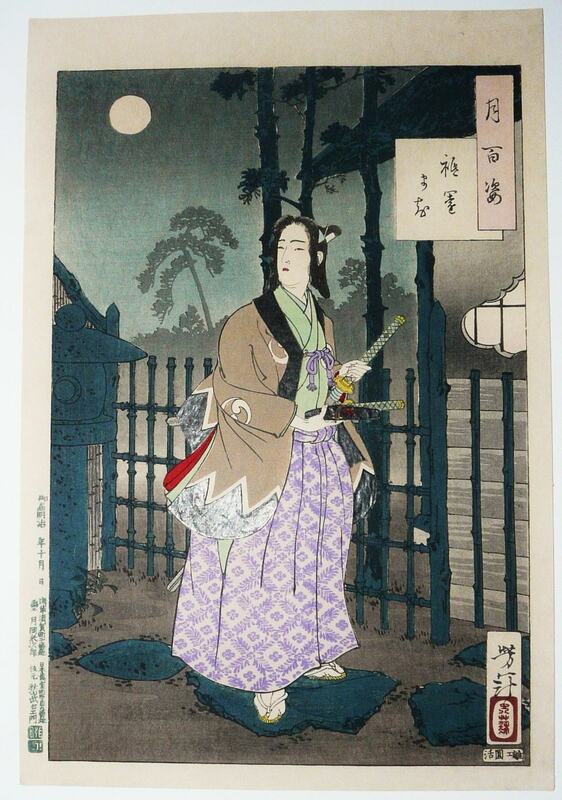 Along with Yoshiiku there were hard times until the release of his most famous and most sought after series the 100 Aspects of the Moon was released and this series about beautiful women and ghosts is still thought to be one of the truly great woodblock print series ever created. Unfortunately his great creative ability and talent had a dark side as he suffered for depression and mental illness and he died of a brain hemorrhage at the age of only 53. 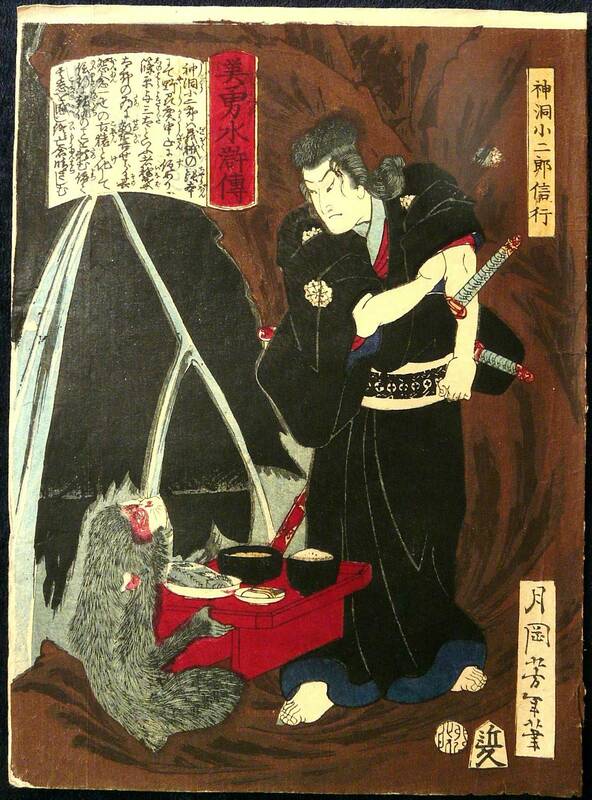 OTHER ATTRIBUTES: Kinkyu Publisher’s Seal in the Lower Right of the Scene alongside Artist’s Signature . 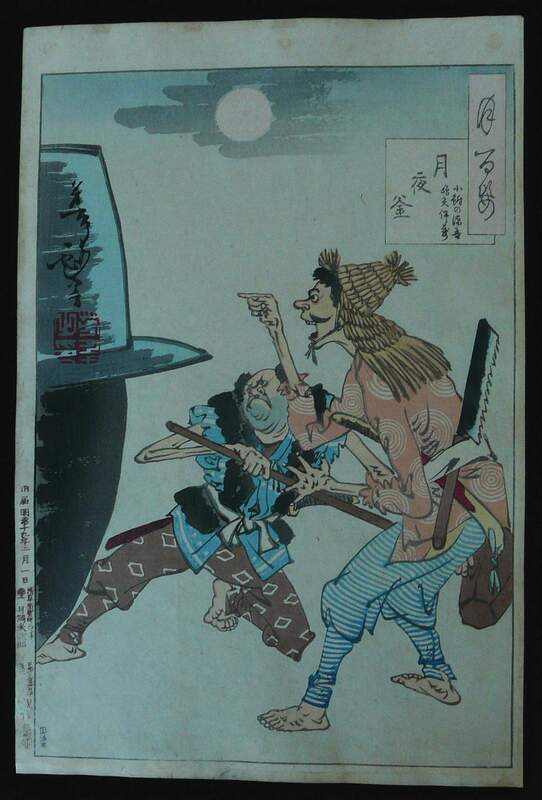 OTHER ATTRIBUTES: Kinkyu Publisher’s Seal in the Lower Right of the Scene alongside with the Aratame Censor Seal for the Year 1866 on the other side of the character’s clog. 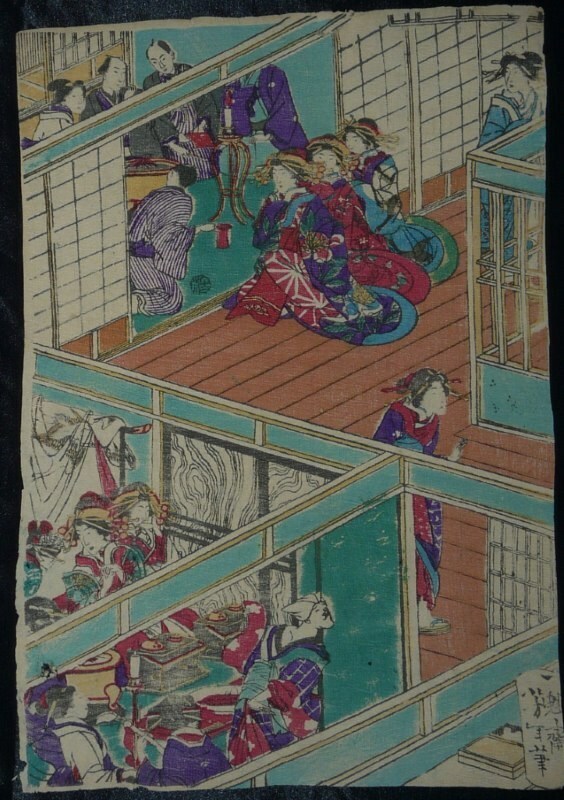 OTHER ATTRIBUTES: Round Aratame Censor Seal for the Year 1867 and Kinkyu Publisher’s Seal in the lower right corner of the scene. 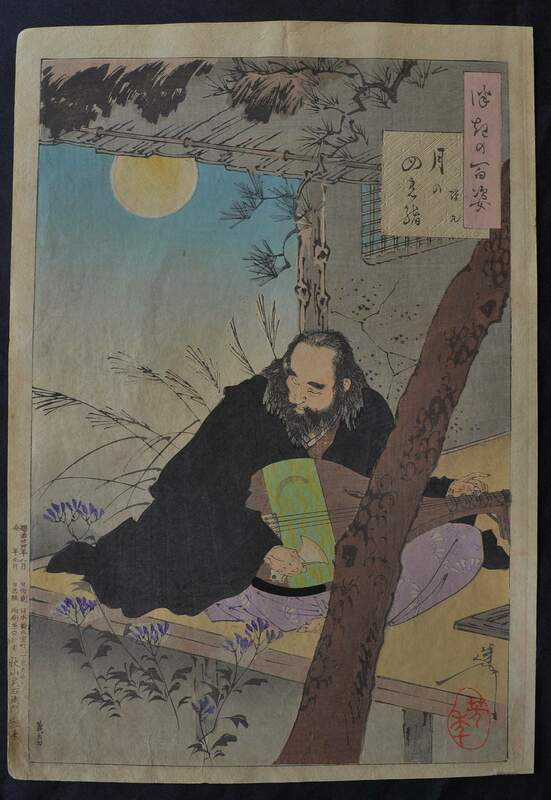 OTHER ATTRIBUTES: Round Aratame Censor Seal for the Year 1867 above the and Kinkyu Publisher’s Seal in the lower right corner of the scene alongside the Artist’s Signature. 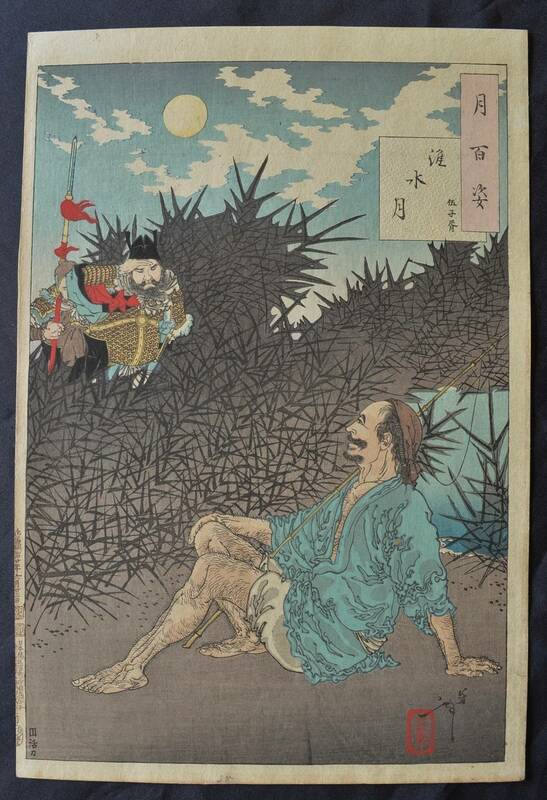 BELOW ARE ORIGINAL FIRST EDITION SCENES FROM YOSHITOSHI’S FAMOUS SERIES 100 ASPECTS OF THE MOON PUBLISHED BY AKIYAMA BUEMON OVER THE PERIOD 1885 to 1892. 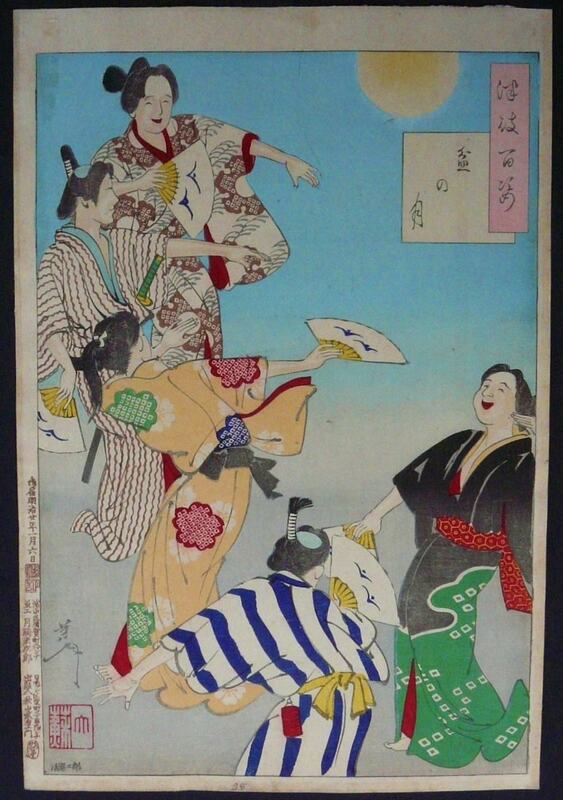 SIGNATURE: Yoshitoshi with Yoshitoshi Red Seal in bottom left of scene. OTHER ATTRIBUTES: NUMBER 90 in the Series of 100 with Artist’s Seal in Lower left of Scene and Full Authentication and Publisher’s Seals in Left Margin. 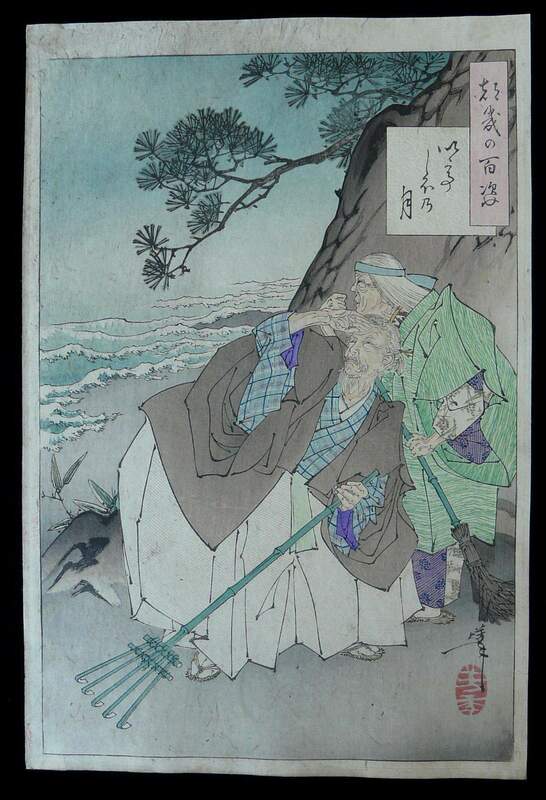 SIGNATURE: Yoshitoshi with Red Seal in Bottom Left of Scene with Full Authentication, Date and Publisher’s Seals in Left Margin. .
OTHER ATTRIBUTES: NUMBER 17 in the Series of 100 with Artist’s Signature and Red Seal in Lower Left of Scene with Full Authentication and Publisher’s Seals in Left Margin. 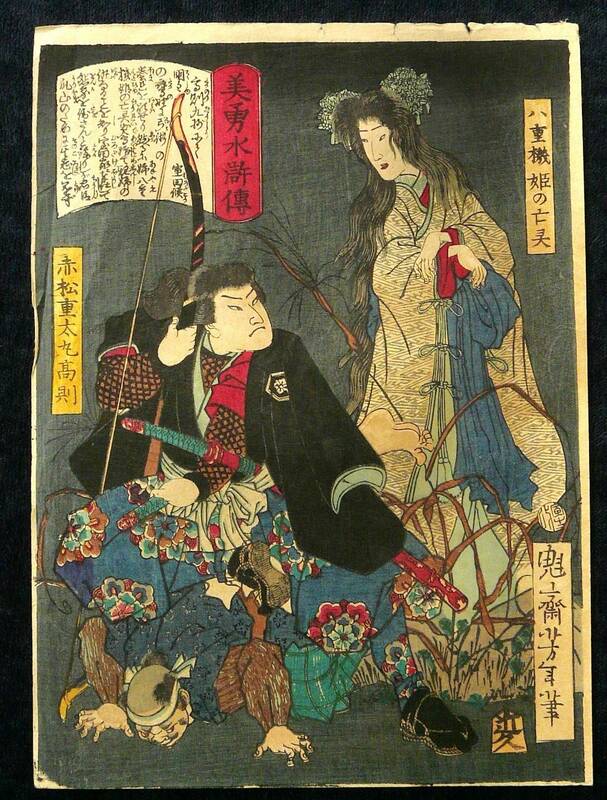 SIGNATURE: Yoshitoshi with Red Seal in Bottom Right of Scene with Full Authentication, Date and Publisher’s Seals in Left Margin. .
OTHER ATTRIBUTES: NUMBER 17 in the Series of 100 with Artist’s Signature and Red Seal in Lower Right of Scene with Full Authentication and Publisher’s Seals in Left Margin.. 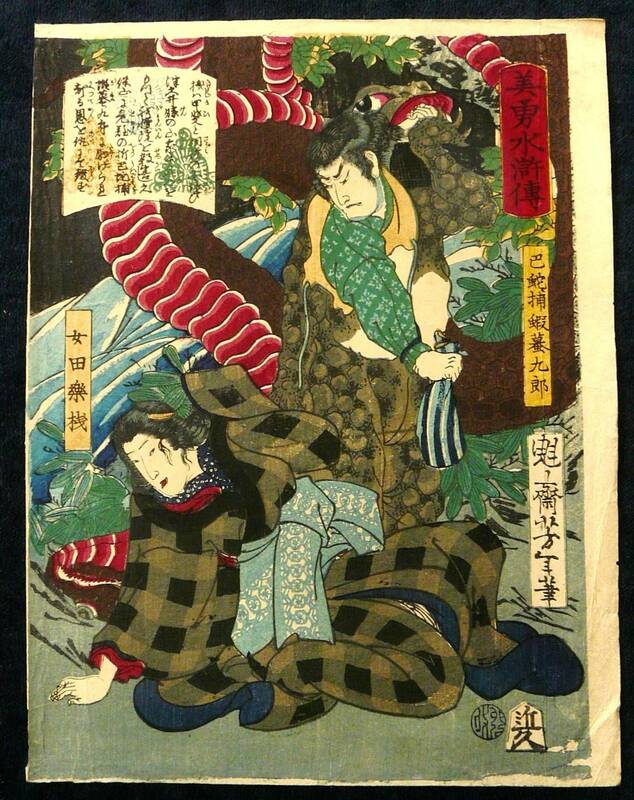 This was the LAST work of Yoshitoshi as he died two months after the scene was published. 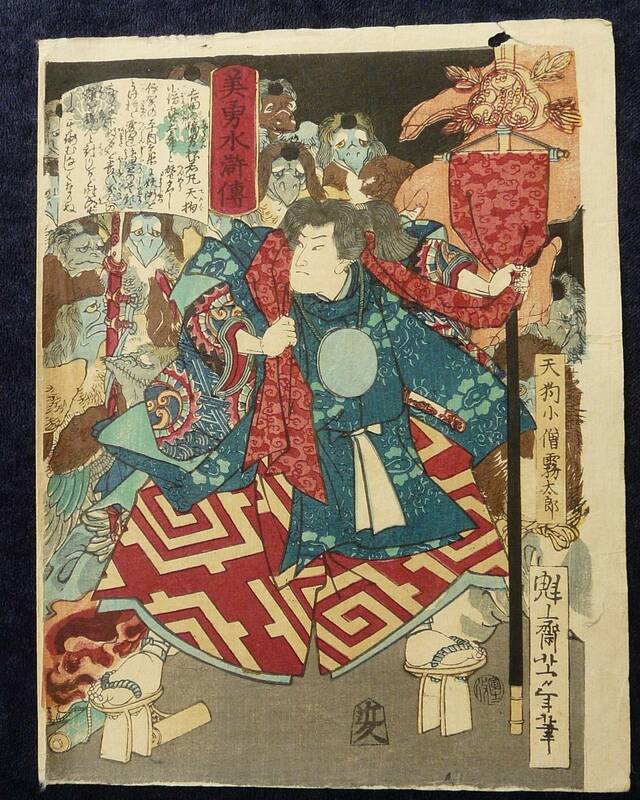 SIGNATURE: Yoshitoshi with Yoshitoshi Red Seal in bottom right of scene. OTHER ATTRIBUTES: NUMBER 98 in the Series of 100 with The Artist’s Signature and Red Seal in Lower Right of the Scene and Full Authentication Date and Publisher’s Seals in Left Margin. 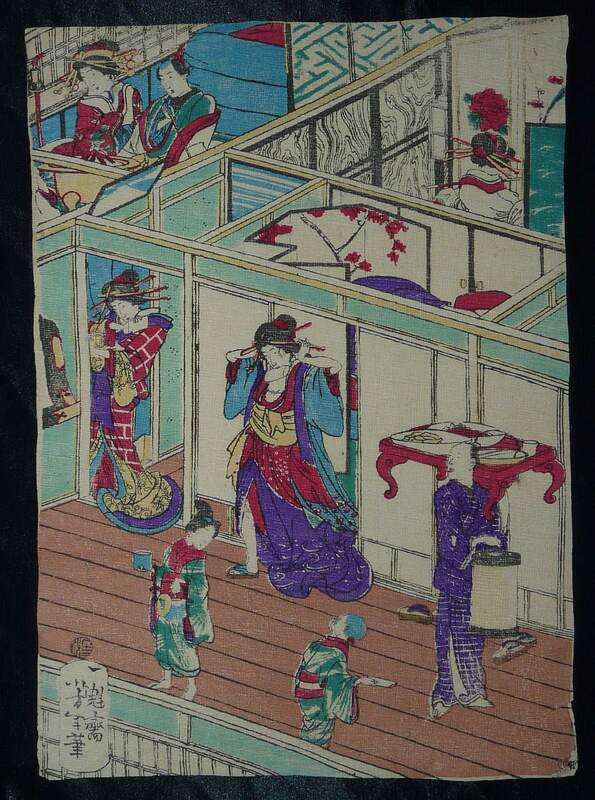 A VERY RARE 129 YEAR OLD WOODBLOCK PRINT IN VERY GOOD CONDITION FOR ITS AGE. OTHER ATTRIBUTES: NUMBER 48 in the Series of 100 with The Artist’s Signature and Red Seal in Lower Right of the Scene and Full Authentication Date and Publisher’s Seals in Left Margin. OTHER ATTRIBUTES: NUMBER 4 in the Series of 100 with The Artist’s Signature and Red Seal in Lower Right of the Scene and Full Authentication Date and Publisher’s Seals in Left Margin. 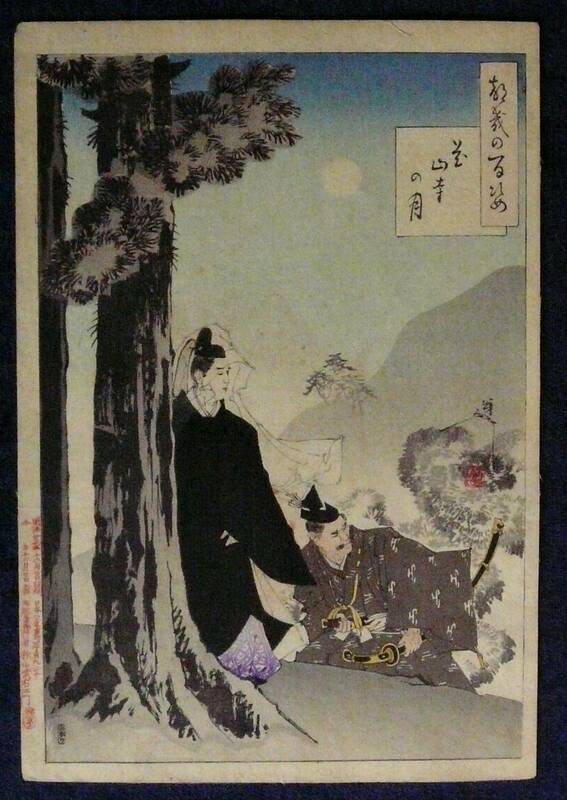 SIGNATURE: Yoshitoshi with Yoshitoshi “No” Seal in bottom left of scene. OTHER ATTRIBUTES: NUMBER 18 in the Series of 100 with Artist’s Seal in Lower left of Scene and Full Authentication and Publisher’s Seals in Left Margin. OTHER ATTRIBUTES: Round Aratame Censor Seal used between 1864 and 1871 above the Artist’s Signature in the lower left of scene. OTHER ATTRIBUTES: Artist’s Signature in the lower Right of scene.